Five other defendants received life sentences over the deadly football riot in Port Said last year. 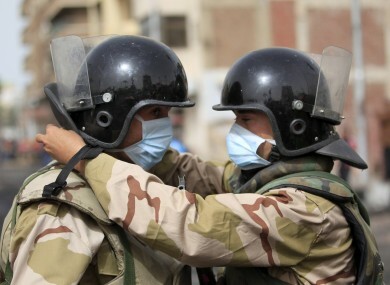 Army soldiers in Egypt prepare their masks yesterday after several days of clashes between protesters and riot police in Port Said. AN EGYPTIAN COURT has today upheld death sentences for 21 defendants over a deadly football riot in Port Said, in a case that has already sparked widespread violence and threats of further unrest. The court, sitting in Cairo for security reasons, also handed down life sentences to five defendants, with 19 receiving lesser jail terms and another 28 exonerated. The initial verdict in late January, in which 21 of the 73 defendants accused in the case were condemned to death, sparked deadly riots in Port Said, home to most of the defendants and where the 2011 stadium violence took place. The February 2011 riot killed 74 people, mostly fans of the visiting Cairo Al-Ahly club. Ahly fans, who have a reputation for organising sometimes violent protests, had warned police that they would retaliate if the defendants, including nine policemen, were exonerated. The court sentenced senior policemen to 15 years each — former head of police security General Mohammed Samak and Brigadier General Mohammed Saad, who at the time of the stadium riot had the keys to the stadium gates, which were locked. Seven remaining police defendants were acquitted. Email “Egypt court confirms 21 death sentences over football riot”. Feedback on “Egypt court confirms 21 death sentences over football riot”.